2018 was a very popular year for our hydrotherapy pools and we’re delighted to say that we’ve won a contract to supply and install a pool worth £169,000 at the new Sandside Lodge School in Cumbria! Sandside Lodge is a SEN school that also hosts pupils with physical disabilities. They’ve decided to include air jets, colour-changing LED lights, and an internal perimeter handrail in the hydrotherapy pool to help with sensory stimulation and physiotherapy activities. We’re also installing another three hydrotherapy pools at the moment in various locations around the UK. The hydrotherapy pool in the ground and covered at Sandside Lodge in October 2018. 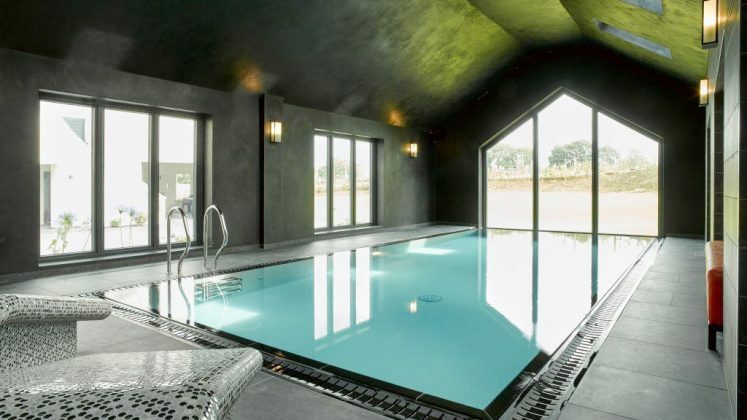 The architects and Seddon Construction first introduced us to the project because they knew we could supply the whole hydrotherapy pool package as well as ceiling track hoist systems. Our team will design and install the entire pool system, including a plant room and environmental control units to keep the room cool. Our signature stainless-steel hydrotherapy pools are proving very popular because of how much cheaper they are to install and maintain over time. Stainless-steel is also incredibly good for infection control purposes to keep any chances of cross-contamination to an absolute minimum. We’re currently installing our hydrotherapy pools at various schools, care homes, and private homes throughout the country. We also installed one at STEPS Rehabilitation Centre in Sheffield more recently – you can take a closer look at it here. Hydrotherapy treatments are used to help with physiotherapy and sensory stimulation. The pool tends to be a lot warmer than a traditional swimming pool to allow your muscles to relax and build whilst exercising. For more information on hydrotherapy and its benefits, read this article. If you’re wanting us to send you a quote for one of our bespoke stainless-steel hydrotherapy pools, fill out the form below!